So many friends have posted during this Challenge how they get up early in the morning to do their writing while no one else is around. By getting up early, it appeared that their houses were quiet, and they had their words and thoughts all to themselves as they composed for the day. The descriptions of peaceful writing (some even had posted pictures) - this was too good to pass up. I wanted to try to create the same writing atmosphere for myself that existed for others. Something I already knew about myself as a writer is that I need a quiet space for thinking, writing, and contemplation. I can't write with lots of other activity or noise in the house. Early mornings might just be the answer. Boy, am I glad I got up so early! Moral of story: Embrace who you are as a writer. Also, try not to drool on your keyboard when typing. Yes! I feel somehow less efficient because I can't write in the morning before work, but it just doesn't work for me! So funny! 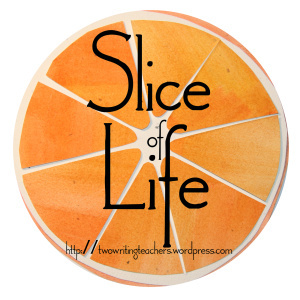 I need quiet to write too--and though I aspire to the morning slice, it rarely happens for me. Embrace who you are as a writer. This is so wise. At the same time, we can sometimes change, especially if we are motivated to write. I thought I could never write anything after 9 a.m. Now I realize that I have more writing times in me than I thought. Your moral is mine, Karen - you just have to write when YOUR moment calls. Your poem, though, was great fun to read. You may have quiet in your home at normal times of the day -- embrace that!! Love your slice and love that you made it a poem. I love funny poems - when I grew up I always thought of poetry as so serious. I love how humor is now present in this genre. One tip -- you forgot the coffee!!! My first post for the #SOL was about how jealous I am of all the "morning people". I feel your pain. What a great post! I, like you, need quiet time to write. I am a slow writer and the word rarely drop onto the page with ease. You will find your writing routines, even if they aren't in the early morning hours. But, keep writing, keep writing, keep writing. The thread of "drool" all the way through makes this a light-hearted fable. Thanks for making me smile. Morgan - if you see my response, what is your blog called? Thanks! Ha! This made me smile ... as I wrote about not being a morning person already. And the morale of your slice is right on! Embrace yourself as a writer and embrace all that you require to be that writer to share your stories! Ha! Karen, you need to be who you are, not who everyone else is. I get up fairly early, but couldn't write earlier, my best time, late evening, & even when I was teaching. It just seems to work better. You wrote this as a comedian would. You are a writer!